PC gamers outside of the UK can now join the Doctor and Amy Pond on their journey through time and space. Doctor Who fans outside of the British Isles have become accustomed to waiting longer than their UK brethren. The latest season featured the shortest wait ever, with episodes airing in the US only two weeks after the UK. Now, another one of those waits is over. A mere seven weeks after its UK debut, the first two episodes of Doctor Who: The Adventure Games are available for purchase internationally through digital distribution service Direct2Drive. Developed by Sumo Digital and published by BBC Wales Interactive, each Adventure Games episode fits in during the storyline of the latest Doctor Who season and features the voices and likeness of the show's stars, Matt Smith and Karen Gillen. Although the Doctor Who games were free in the UK (as a result of the government-imposed tax that funds the BBC), Direct2Drive is charging $4.95 for a bundle containing both episodes. The digital distribution service currently has the bundle on sale for the impulse-worthy price of $3.70. Both PC and Mac versions of the games are available in their home territory. Direct2Drive is currently only selling the PC version, but it would be reasonable to assume that the Mac port will become available in the coming days. The first Adventure Games episode opens with the Doctor coming to Earth only to find the human race extinct. He must warp to the home planet of his archenemies, the Daleks, and correct time and save humanity. 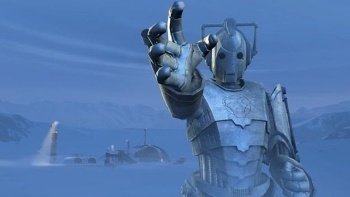 The second episode brings the Doctor and Amy Pond to the Arctic, where members of a geological survey have begun to transform into deadly robotic warriors, known as Cybermen. Two additional episodes are slated for release in the coming months in the UK. We should expect international releases of both after a similarly short delay.